This week’s Netflix film, I Am Michael, deals with gritty and complex ecclesiastic issues of viewing and dealing with sexuality and gender in the church -- and those things will be discussed in this post. But first, a pet peeve: how films deal with crucifixes and crosses in film. This isn’t just a matter of aesthetics, but of theology and values. It’s common to see characters in movies attend what are purported to be independent, fundamentalist churches, and yet the sanctuaries where they’re worshiping have crucifixes. In the real world, fundamentalist churches have empty crosses, while Catholic churches (and Lutheran and Episcopal churches, too) display crucifixes -- crosses with Jesus suffering. 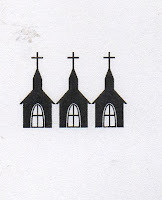 These different kinds of crosses are displayed because there’s a difference in emphasis. The Catholic Church focuses the perpetual suffering of Christ, which leads to a greater emphasis the sin which led to His suffering. The empty cross is said to emphasize the power of the resurrection and to focus on God’s grace rather than people’s sins. 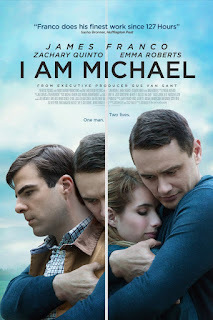 I Am Michael, a 2015 biographical film, repeats the error of showing a crucifix in independent, fundamentalist churches, but it’s a more interesting, more plausible, mistake in this film. 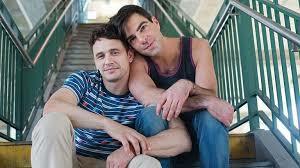 Michael Glatze, who in the course of the film is shown making a transition from gay activist to (Protestant) Christian pastor, seemed to be obsessed with blame and punishment in all the stages of that change, both as LGBTQ spokesperson and as a fundamentalist. Glatze's sexuality is frankly presented, as is his spiritual struggle. Michael and Bennett are particularly concerned about bullied, sometimes suicidal, gay teens. They tour the country, speaking and writing to encourage young people to accept themselves as they are. They also use their platform to advocate LGBTQ rights and causes. While traveling, they meet a gay student at Liberty University in Lynchburg, Virginia. They ask why he’s there at a school that is not “gay friendly.” The student explains that he didn’t come out to his family and friends until he had already gone to Liberty for two years, and he wanted to complete his degree. And he is still a Christian. A gay Christian. We then see a young woman, a friend of the young man’s, in the background. Surrounded by other women, she’s crying because her mother has died. The young man leaves Bennett and Michael to pray for his friend. Michael is obviously moved by the incident. Michael’s own mother died a few years before, and he’s still dealing with it. He wrestles with the possibility of life after death and his family history of faith (his mother was a nondenominational Christian, while his father was agnostic). He’s afraid for his health, afraid he’s dying of the same heart trouble that killed his father, but doctors find nothing wrong with him and attribute his symptoms to hypochondria. Bennett believes he is suffering a mental breakdown. Michael begins a spiritual journey, exploring Buddhism and Mormonism. During this time he begins to question his own sexual preferences. As a gay activist, Michael speculated that there’s really no such thing as gay or straight, but that human sexuality falls on a spectrum. During his search, Michael proclaims, “I no longer identify as gay,” and he begins to write very critical things about the LGBTQ movement. He goes to a Buddhist retreat center which claims to accept anyone, but is asked to leave by the director of the center (Daryl Hannah) because she considers his anti-gay blog posts to be hateful. Michael goes to a small fundamentalist Bible college in Wyoming, but finds himself in conflict with the faculty. He appreciates what he learns about Scripture, but believes the leadership of the school is authoritarian. Also at this school, he meets Rebekah (Emma Roberts), and falls in love with her. They are married and go off to pastor a church in a small town in Wyoming. A sign outside identifies the church as Shepherd of the Plains, and it seems much larger, fancier, and better maintained than churches I’ve seen in small, rural towns. Throughout the film, Michael seems to be a very troubled man. He is judgmental of Christians as a gay activist and judgemental of gays as a Christian, but he does come to see the Bible as “full of love.” From a documentary we saw earlier this month, Michael Lost and Found (also on Netflix), the real Michael Glatze seems to have come to more of a state of grace. 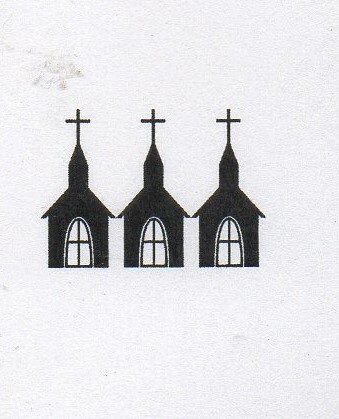 Because of this, I have hope for the church we see Glatze pastoring at the end of the film, and I’m giving that church a Movie Churches rating of 3 Steeples.